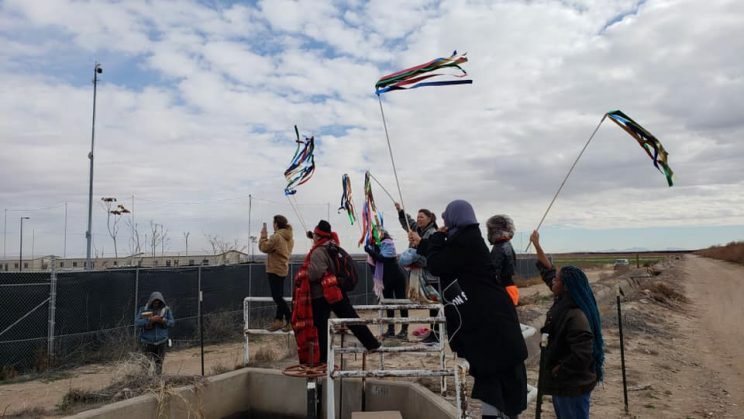 Tornillo, TX – Indigenous people, migrant rights activists, and their allies are entering the second week of a protest occupation at the gates of the USA’s largest detention facility for immigrant children. The controversial prison camp, which exclusively holds immigrant minors, is based in Tornillo, Texas. The Trump administration began housing youth in tents at this port of entry facility in June 2018 to accommodate the increased detentions from the ‘zero tolerance’ crackdown this past summer. Originally constructed as an emergency shelter to hold over 300 minors ages 13-17, the Tornillo camp has since expanded to a capacity of 3,800. On December 25, there were about 2,300 children at Tornillo. Since the facility opened, about 6,200 children have been placed there and 3,900 have been released to relatives or sponsors. 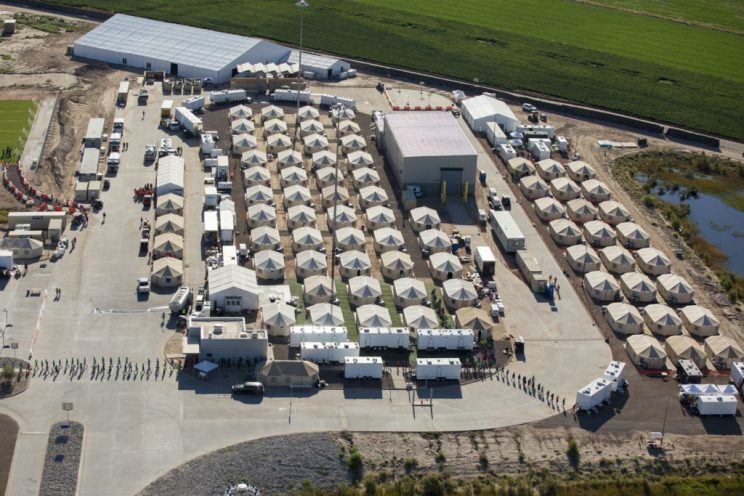 The tent city detention camp is being run by the Department of Health and Human Services (DHHS) and the placement of youth with sponsors is coordinated by the Office of Refugee Resettlement (ORR). Recent policy changes at children’s facilities have integrated immigration enforcement with placement of minors with sponsors, meaning ICE is involved in screening of family or friends of family. This has slowed the reunification process and weaponized the family reunification process which can now lead to the deportation of sponsors. 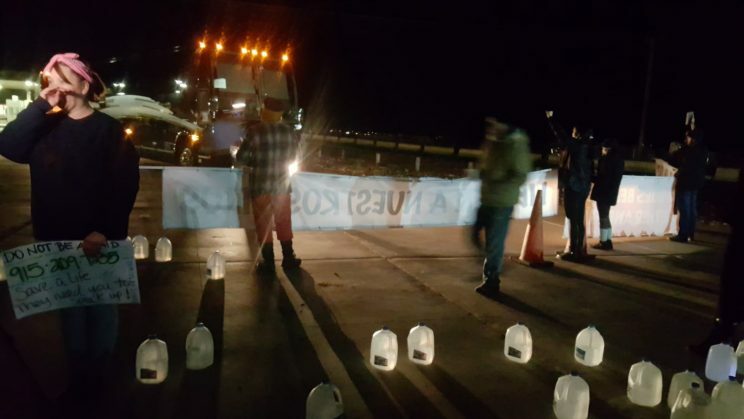 Organizers used banners and scattered gallon jugs of water to block the road. 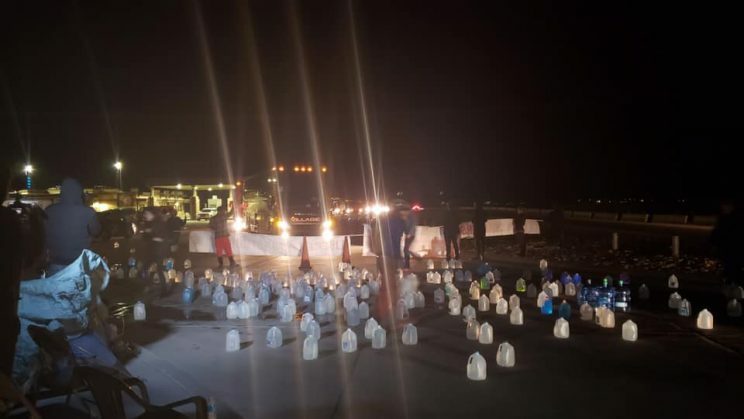 The water jugs were used to represent how migrants are deprived of water both in the desert and in detention, as seen in the recent deaths in custody and the vandalization and criminalization of humanitarian aid. The action camp in Tornillo, called ‘Christmas in Tornillo‘, is entering its second week. They started on Christmas eve and have organized daily actions outside of the Customs and Border Protection station. Agitation by activists at the camp has included art workshops, passing notes to the detained youth written on soccer balls, puppetry, and canvassing in the hotels where workers are staying to share information about how to come forward as whistleblowers. There are also concerns about the children being deprived of adequate legal representation and education. The superintendent of Tornillo schools has also not been allowed into the facility. Recent deaths of minors in US immigration custody have called into question the provision of medical care, as well as the lack of background checks for workers in the facility. These are conditions ripe for abuse and neglect. The detention facility at Tornillo is the current manifestation and a dark turn in a recent, but not new, policy of incarcerating migrant children. Trump’s zero tolerance policies and former Attorney General Jeff Session’s changes to asylum practices has led to higher rate of detention for longer periods of time that existing facilities have struggled to accommodate. However, existing legal obligations require minors to have access to courts and limit how long they can be held in custody without legal recourse. One impact of these changes has been to contribute to family separation by forbidding domestic violence survivors from making asylum claims, while at the same time stripping them of their parental rights. Many say this is nothing but victim blaming at its worst and most vicious. The efforts of the Office of Refugee Resettlement towards family reunification has been weaponized by the recent arrests of children’s sponsors. Most of the children do have sponsors, however new policies, such as required finger printing of sponsors, involve ICE and enforcement in the sponsorship process that had previously been handled by ORR and DHHS. While DHHS has promised that they are planning to close this child detention camp, they renewed their contract to continue into 2019 with Baptist Child and Family Services, an NGO based in San Antonio, TX. Part of their plan to close this camp is to expand the capacity of a facility in Homestead, from 1,350 to 2,350. Members at the Tornillo protest encampment insist that they are determined to not only close Tornillo, but to fight the dehumanizing system of incarceration and human rights abuses. Organizers have put out an open call for people to join the protest encampment.